Posted 4 February 2014 & filed under 1960s, 1970s, Life and leisure, People, Sport. The Cottonmill estate used to have a football club. 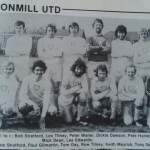 There were two teams: Cottonmill United and Cottonmill Reserves. 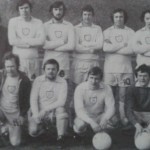 The teams played in the St Albans Sunday league which they joined in 1964-5 to be in Division Two. They were in Division One by 1965-6 as B. Robinson was designated a ‘top marksman’. 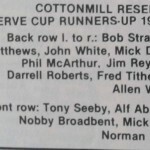 The Reserves were in Division Two in 1965-6 where N. Mitchell, B. Crowney and L. Tilney were in the list of ‘top marksmen’. They played in what the locals called the ‘top playing field’. There was ‘the bottom one’ down one end of Cottonmill Lane which backed on to the St Albans to Hatfield line, now the Alban Way; and the ‘top playing field’ was at the other end of Cottonmill Lane opposite Nuns Lane. This is where the Cottonmill Club was built. 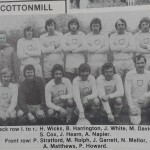 When the club first started, the team used the bottom playing field, but when the Cottonmill Club was built they moved up to the top one as it was a better football pitch up there. The Cottonmill Club was a thriving social club at one time. The community centre was situated approximately where the car park of the Marlborough Pavilion is today, in Old Oak, Cottonmill Lane. The club closed by the early 1980s.